Biophilic design is design that is sympathetic to nature. Designers who want their buildings and landscapes to exhibit biophilic qualities have at least 70 attributes to draw on, e.g. use natural colours, water, plant motifs, natural shapes and forms (like shells), allude to growth and other natural processes, introduce natural and filtered light, connect with history, the spirit of a place, promote curiosity, attachment, and sometimes be daring. These are from a list compiled by social ecologist Stephen Kellert in the book Biophilic Design. The list includes practically every conceptual device a designer might employ to help the design process. Following the Romantics, many still think that wholeness, unity and coherence are the pivotal virtues of designing: “People prefer in natural and built environments the feeling that discrete parts comprise an overall whole, particularly when the whole is an emergent property consisting of more than the sum of the individual parts. This integrative quality fosters a feeling of structural integrity, even in complexes of considerable size and detail” (10). For such bioromanticism, materials also ought to yield to the effects of age, change and the patina of time, a characteristic of natural materials. By way of contrast, “artificial products rarely evoke sustained positive response even when they are exact copies” (10). I don’t think it’s exact, or nearly exact, copies of nature that yield the most positive response. The book provides helpful images of buildings and places that demonstrate biophilic harmony: the Sydney Opera House, 30 St Mary Axe (the gherkin) in London, ivy-covered courtyards, and examples less familiar. But I think I could find as much pictorial evidence for sustained positive responses from the artificial as there is from the biomimetic. There’s nothing particularly “natural” about Le Corbusier’s tubular steel chair, Michael Graves’ chrome whistling kettle, or an iPad. Comfort, novelty and function come into play, but it’s cheating to attribute every successful design to nature, or biophilic design. Much good design works through contrast and difference, and can enhance a sense of the natural, not by imitating it, but by presenting as its opposite. Perhaps it’s the stark contrast provided by an alien, artificial and “unnatural” object in the landscape that brings the natural into relief — draws our attention to that particular context as “natural,” and defines the natural for that place and time. Sculpture often does this, but so can buildings, bridges and motorways. I recall this was the message of Sylvia Crowe in her classic book The Landscape of Power, in which she taught us to appreciate those giant cooling towers and gasometers (that are now disappearing from the landscape). In any case, interpretation comes into play. Harmony, wholeness and unity may be as much in the eye of the beholder, or the camera, as they are properties of the place. Any of the pictures in Biophilic Design could be photographed under lighting conditions and in such a way as to look less harmonious , and they could be captioned or described to make the case either way as to their visual, structural or natural integrity. The two images on this page are of a couple of bold interventions into the Scottish countryside, the success or failure of which doesn’t need to rely on concepts of harmony, mimicry or natural processes. The first is the Falkirk Wheel that raises pleasure vessels from one canal system to another by means of a rotating elevator (British Waterways Board, Arups, Butterley Engineering and RMJM architects). 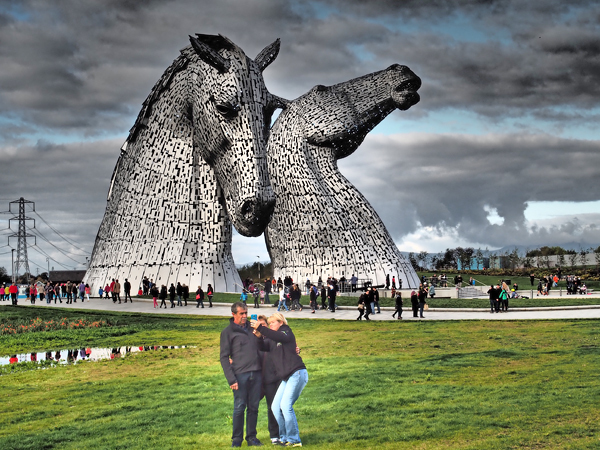 The second is a massive steel sculpture of two horses (kelpies) heads (by sculptor Andy Scott) part of a landscape regeneration scheme also near to Falkirk. Martin Heidegger advanced the view that things in the landscape reveal something important about their context: “The bridge gathers the earth as landscape around the stream” (152). He was talking about stone bridges. But recognising Heidegger’s overtly romantic references, philosopher of technology (and post-Heideggerian) Don Ihde asserts that this capacity of things to reveal place, nature, ecology, etc applies to objects of steel as much as to stone, and even to nuclear power stations, especially if we take politics into account. Ihde, Don. 1995. Postphenomenology: Essays in the Postmodern Context. Evanston, IL: Northwestern University Press. Kellert, Stephen R. 2008. Dimensions, Elements, and Attributes of Biophilic Design. In S. R. Kellert, J. Heerwagen, and M. Mador (eds. ), Biophilic Design: The Theory, Science and Practice of Bringing Buildings to Life: 3-19. Hoboken, NJ: Wiley. As well as “natural” places there are non-places, which are part of real human environments. Not everything that’s interesting is beautiful. See post: No way logo.